If you're looking for pristine white sandy beaches, incredible water sports, mouth-watering restaurant specialties and comfortable accommodations, make sure to visit Aruba. Whenever you want to have a very memorable vacation in some parts of the Caribbean island, the annual Aruba events will definitely make that tropical getaway plan unforgettable. The following are some of the best events that you can look forward to when you're in this paradise. In the month of January, there are already 11 events that any guest can enjoy. These yearly events include the Grand Final Tumba Contest, Youth Carnival Queen Election, Children's Carnival Parade in San Nicolas and the Carnival Celebration. The Carnival festival is known to be the biggest event of the year in Aruba where creative contests and street parades occur. Every February, the Mrs. Carnival Election, Children's Carnival Parade in the Noord, the Carnival Showdown Window to the World and other events happen annually. In March, 2 main events are celebrated yearly. The Aruba International Half Marathon (21 K) and the National anthem and Flag Day are celebrated on the same month. Right after the latter event, games and several sporting events for kids and adults are held. On the fourth month of the year, the classical and superb Piano Festival is being celebrated. Aside from that, Queen Beatrix's birthday is also being celebrated on the same month. After such celebration, sporting events such as kite flying and other contests are being done. The International Boulevard Race is also being practiced where more than 200 individual competitors from Aruba, Holland, Colombia, the USA, Netherlands, and Venezuela join. During the month of May, the Soul Beach Music Festival is also being held. This event has even featured popular artists such as Alicia Keys, Boyz II Men, Brian McKnight, Sean Paul and more. The Beach Tennis National Championships in Aruba is also celebrated on the same month every year. On the sixth month of the year, the Food & Wine Festival are being celebrated annually. In this event well-known chefs showcase their expertise and boast their tasty food item specialties that even include some wine tasting activities. Aruba's International Triathlon, St. John's Day together with the Hi-Winds are being celebrated in an annual basis. 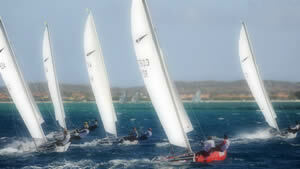 The Hi-Winds in Aruba is considered to be the biggest amateur windsurfing activity both sexes can join and compete. Every July, the Annual Reef Care project in Aruba is being practiced by the Arubans to keep their water environment clean. Every August, the International pro-Am Golf Tournament in Aruba is being held by teams of golfers consisting of professionals four amateur golfers in a team to compete during the 36-hole event. On the month of September, the Turibana to Santa Cruz is also being celebrated annually. The Aruba Poker Classic and Black jack Tournament are the events any poker and blackjack fanatic could look forward to on the 10th month of every year. This tournament does not limit Texas Hold'em players from playing if they will be coming from several different countries. Also, the Music Festival in Aruba and Fire Prevention 10k and 5k are being celebrated on the same exact month. On the 11th month of the year, the Beach Tennis International Championships, the Heineken Catamaran Regatta and the National Coastal Clean-up are being celebrated on a yearly basis. The Regatta event decorates this tropical place's turquoise waters with all the colorful sails of the catamarans from Europe. Then, every December, the Saint Nicolas Day, Boxing Day, Christmas and also the Dande Festival are being celebrated on a yearly basis. With these yearly Aruba events, your stay in this place will truly become precious. Other than enjoying the festivals and other vents, you will also meet a lot of courteous Arubans who will make your vacation more worthwhile. You will absolutely have the greatest tropical getaway in your whole life.